Surrounded by lovely, gently rolling Sussex countryside and Listed Grade II, Pennybridge Barn is a magnificent conversion of an eighteenth century Sussex Barn. 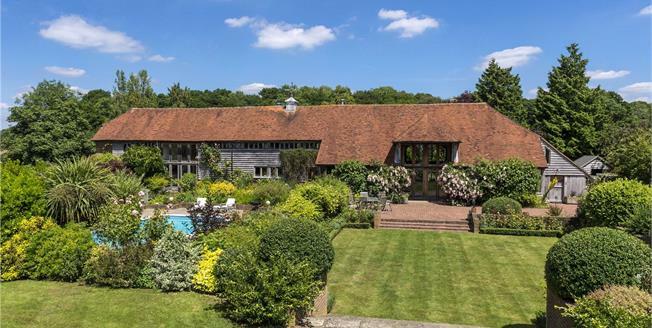 With traditional external elevations of weatherboarding under a majestic Kent peg tiled roof including a cupola with weather vane, the house has exceptional accommodation arranged over two floors. Windows and French doors are oak framed double glazed units allowing for a fine aspect over the gardens and maximum light penetration, internal doors are timber latched and the imposing oak frame is evident in the vaulted ceilings. Having been the subject of a programme of a sophisticatedly stylish refurbishment by the present owners, the architectural detailing marries skilfully with modern day technologies such as under floor heating to the ground floor and hard wiring for internet connectivity. The open plan living space is a free flowing family area with a flagstone floor throughout which has under floor heating and incorporates a sitting area with fireplace, casual dining area and a kitchen/breakfast area furnished with hand crafted cabinetry and black granite work surfaces, an Aga and a walk-in larder. Elsewhere on the ground floor are a dining room, a drawing room with an inglenook fireplace and the family room. There is also internal access to the annexe, a utility room, boot room and boiler room. The annexe is self contained with access from both the house and externally and has an open plan living space with kitchen together with a bedroom with an en-suite shower room. The first floor is given over to five bedrooms, divided in two sections. To one side of the vaulted living space and accessed via an oak staircase, is what is presently used as the principal bedroom accompanied by a large en-suite bathroom, which has been furnished with heritage style sanitary ware by William Holland. Four further bedrooms – one en-suite – and the family bathroom are arranged to the other side and conveniently serviced by a staircase at either end of the landing. Pennybridge Barn is set off a quiet country lane just under a mile and a half from Mayfield Village. Mayfield is a conservation area and one of the most sought after villages in the area due to its active local community, character property, eclectic array of local shops, quaint public houses and cafes along with the renowned Middle House hotel and restaurant. The ever popular Royal Spa town of Tunbridge Wells is seven and a half miles (to The Pantiles) and has superb facilities from theatres, hotels and nationally known departments stores, to historic sites and artisan shops. For commuters there are fast, direct train services to the City of London and the West End from Wadhurst Station (4.4 miles), whilst the A21 trunk road can be accessed at Lamberhurst (approximately 7.6 miles away) connecting with the national motorway network via the M25. The area is renowned for walking, sailing on the famous Bewl Water Reservoir and equestrian facilities, whilst golf can be found nearby at Dale Hill and Lamberhurst. There is an excellent choice of schooling in the area at primary and secondary levels, in both the state and private sectors including primary schools in Mayfield, Lamberhurst and Wadhurst, Sacred Heart at Wadhurst, Marlborough House and St Ronan’s prep schools in Hawkhurst. Senior schools include Mayfield School for girls, Uplands Community College in Wadhurst, Benenden and Bede’s in Lower Dicker. The property is approached off a quiet lane via a private drive which spurs off to provide access to the paddock from where there are stunning views of the surrounding countryside. The main drive continues via an electrically operated five bar gate sweeping through the grounds to a parking and turning area in front of the detached garaging. Large expanses of level lawn extend to some light woodland on the perimeter, whilst elsewhere there is a rose garden with a stunning variety of shrub roses and herbaceous borders stocked with colourful perennials. Adjoining the house is a brick terrace extending to the kitchen garden to one side and a courtyard with separate access on to the lane servicing the annexe and providing extra parking. The ‘L’ shaped pool has a surrounding terrace and pool garden with a pool house. The paddock has a steel framed barn with power and water connected, which could easily be reconfigured to provide stabling.